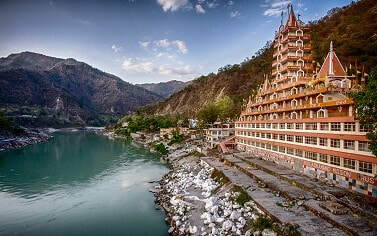 Visit Rishikesh and fully live it's wonderful environment! You can choose to camp in the forest or to stay in a comfortable hotel, then go for a sunrise trekking at the Kunjapuri temple, chill at the Neer Waterfall and have a full day of rafting in the Ganga river. Join this 4 Nights / 5 Days unforgettable adventure trip to Rishikesh and stay in full contact with the nature. Arrival at Rishikesh and transfer to the camp or hotel, depending on your choice. The first day is for the check-in or for the setting up of the camping equipment. Leisure day. You can freely plan for local local sight seeing to the temples, ghats and ashram in and around Rishikesh, such as Neelkanth Mahadev Temple or Triveni Ghat. ​You can also plan for activities like bungee jumping, giant swing or flying fox (not included in the package). ​In the evening back to hotel or camp site. A full day trek. Wake up early and reach Kunjapuri temple for sunrise, then trek from Kunjapuri temple to Rishikesh through the great Neer Waterfall. ​In the evening there will be bonfire and a special dinner; then back to hotel or camp site. ​​​In the evening back to hotel or camp site. Leave for your next destination with flash back memories.